We are continuing our little series of how to get referrals and how to convince people to become preachers and preach your business and do your marketing for you (which is one of the holy grails of business). 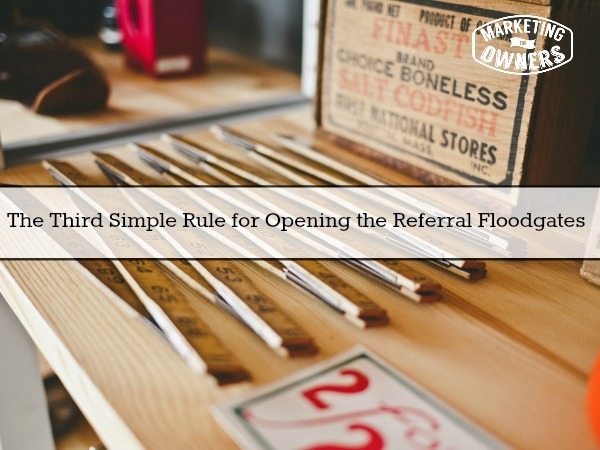 Our series started with ‘Make yourself referable’. The second one in the series is ‘Convince yourself and your staff that you are referable‘. If you don’t believe that you’re brilliant, if you don’t believe you’ve got something good to offer, then you’re not going to be able to refer yourself or to get people to refer you very effectively. So what’s the third one? Number three is very simple — ‘You don’t ask, you don’t get’. Yes, you have to ask people to refer you. Now again this is going to involve a bit of mindset changing. I can guarantee if I stood on stage in front of any crowd of business people and asked people to throw out or to suggest what are the most popular ways of getting business and if when I get to the hands up referrals, most of the audience will put up their hands because everyone assumes that they’re getting referrals. The main reason you assume that is because most people have no idea of how to track where the customers are coming from. They just assumed that they’re getting them by word of mouth if they’re not advertising themselves. So, if we go into detail with that same audience, and ask, “Okay, how are we getting those referrals” then it starts to get a bit crazy. That’s where people show that they are assuming they get referrals. It’s the way of the world. But, what we’re missing out on is just simply asking your customers to refer you and there’s many ways of doing this. You need to change your mindset first. You need to understand that when someone is referring your business, you are helping them look good. You are helping them; you are making them look good. A handful of people with websites will say, “Oh I can recommend this person and I can recommend that person, or I can recommend this host”. Why do we do that? Because we want to look like we know what we’re talking about. We want to look good; we want to look like experts. You would say, “I know a great baker, you should go to this person” , and you’ve had a good experience, so you know they’re going to get a good experience but you also want to make yourself look clever. This is the way it goes, so, once you can get that mindset, when people recommend your business they are making themselves look good. They are not just helping you, they are also helping themselves. That’s the first step. Now, as far as asking them, once you provided the service, are you scared to talk to your customers and ask them how good they thought it was? Imagine if you’re a painter and decorator. You’ve just painted somebody’s home. You’ve done all their outside work. You’ve got to go and get the money, so when you hand the invoice, how about having a little question there and say, “Can I have a minute of your time; I just like to know what you thought of the service? Make sure to please give me honest answers, and don’t give me the answers that you think I want to hear. Ask for names, ask for phone number or ask for an address. Just physically ask, you’ll be surprised how many will actually give you the answer. Now if they’re not keen on it, they may say no and that is okay. Just tell them, “Okay, would it be possible that you hand them this. I will write your name on it as the recommending source, so when they come back to me, I will give you a gift, is that okay? How many of these can you give out”? Don’t give them too many as you don’t want them to feel pressured — just make it easy. Imagine if every customer handed out a couple, okay? Then when you’ve gone out, drop something through their next door neighbors and the next door neighbor at that and say, “We have just completed a painted job at this house”. Ask for a recommendation, they would be delighted to tell you what they think. Because of course you’ve just spoken to them and they said what a great job. This trick always gets more referrals. You can think of many, many other ways of doing this. So just work on asking people to refer you. It works. Its genius and it’s so simple. Today’s drive time podcast is one of my favorites. I’m going to let you in to a secret, Amy is definitely one I listen to all the time. 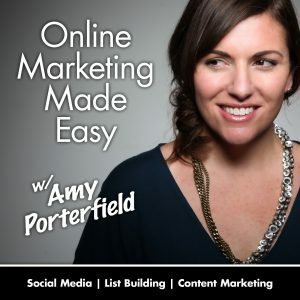 It’s called Online Marketing Made Easy; it is from the wonderful Amy Porterfield. It comes out once a week. It is one of the best quality marketing podcast I know because of the information she shares. She quite often interviews other people and gets a lesson from someone else. You will learn something from her. Visit her website at Amyporterfield.com because all her posts are made up of her marketing podcast episodes. You will not be disappointed. Who could you ask for a referral?